As of July 2009 I have stopped updating this site. My new page is more up to date. I started in my current position in Fall 2004. I got my Ph.D. in Computer Science from University of California, San Diego for work under the supervision of prof. George Varghese (2003). I also have a Master's and an Engineer (5 year undergraduate curriculum) degree in Computer Science from the Technical University of Cluj-Napoca (1996 and 1995 respectively). 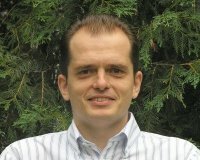 I have worked as software developer at two startups, Ensim (2000) and Netsift (2004), and as network administrator at the second largest node of the Romanian academic network (1995 to 1998). Network devices use increasingly sophisticated methods to recognize malicious traffic and various categories of traffic to be given lower priority. The main focus of my research is on the algorithmic and architectural aspects of controlling network traffic and protecting from network security threats. More details on my research summary page. For a more comprehensive view see my publication list (also available sorted by area). I have served on the program committees of the following conferences and workshops: SIGCOMM (2010,2008), SecureComm (2009), Internet Measurement Conference (2008,2006),IEEE LANMAN (2008), HotNets (2006), International Conference on Network Protocols (2006), CoNext (2006), and VizSec (2006).